Photographs are an invaluable source of information for the historian. Whether capturing events on a national scale or those of the locality they provide a unique insight into the events, people and places which they portray. However, it is clear that they have been all too often under utilized by the historian. In the local context photographs provide the perfect window on the past. Photography became widely accessible in the west of Ireland only in the final decades of the last century when many families had their photograph taken in studios by travelling photographers who, according to many of the older people seem to have made a lucrative living from touring the countryside with their impressive looking cameras. Certainly many families in East Mayo succumbed to the lure of the camera judging by the survival of many miscellaneous group photographs dating from the 1890's and early years of this century which are evident in many family albums. Photographs from a locality are an effective tool for the local historian and work on a number of different levels. As an important social record they often capture not just a moment in time but more specifically often provide a vital record of place. The situation of a photograph; its backdrop, the landscape, setting, buildings and people portrayed provide much of use to the historian. A recent example in Achadh Mor parish serves to illustrate this degree of usefulness. An old family photograph which was dated roughly to the 1950's, and in which many of the group were unidentifiable was much more precisely dated by the details which were in the background. In this case the haystacks in the background were tied with sugans and a T.V.O. Ferguson tractor which was recognised as one of the first of its kind in the area, thus dating the photograpg to the 1930's. Mayo Abbey also provides an example of this in the townland of Knockaunakill where a photograph of children out playing in a field may show up an archaeological monument which is now gone. Photographs were often taken at events of local and national interest and thus provide an important social and historical record. The older people included on these can often be identified by younger members who remember the particular event, a parish sports day, a local spraoi, the station mass, the victorious team, the meitheal etc. etc. For the historian these photographs are a vital link with the past and the people who have gone before. So much of our past has already been lost, forgotten or disregarded. We have an important part to play in its reconstruction. Many incidental details in a photograph tell us much about our ancestors and the lives they lived. Their clothing helps to date the photograps; similarly moustaches and beards which seem to have been "all the rage" in the 1890's. 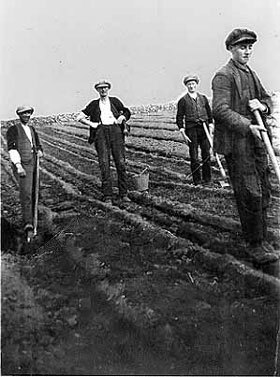 Farming practices, tools used, plough types, harnesses also help us to date photographs and to learn about what life was like for previous generations. Photographs are vital too in providing a record not only of buildings and places but are often our only record of people. When used in conjunction with other historical sources from the 19th century, eg. Griffith's Valuation of 1856 and with the 1901 Census we can, with a fair degree of historical accuracy, reconstruct a family, townland or village for future generations. Emigration has deprived us of many individuals and indeed whole families whose only testament is "the home they left behind", now often ruinous and neglected. Often these families are scarcely remembered by the present generation; their names becoming part of local lore. Ironically however, many emigrants can provide us with a link with our past. Often when they arrived in England or America they had their family photograph taken to send home to parents, brothers and sisters in order to show the people at home that they arrived safely and were doing well. A collection of this kind of portrait would be a great asset to the local community enabling a fuller, more vivid picture of the past to be recorded for present and future generations. In this year of the anniversary of the Famine we have the perfect opportunity to "re-people" our townlands and villages with the help of folklore and photographs. Many died, or emigrated without trace; others were adversely affected by the resulting poverty. With our heightened awareness of our history, because of the Famine anniversary, we can do a lot to redress the imbalance which the lack of historical sources has left us. The collection of old photographs depicting our people and our past will be of great benefit in this act of rememberance and an important record of our community. The pace of change in the 1990's makes even the 1950's seem like a world apart. Technology transforms our lives continuously, brings us further away from our past and erases our memory of these times.